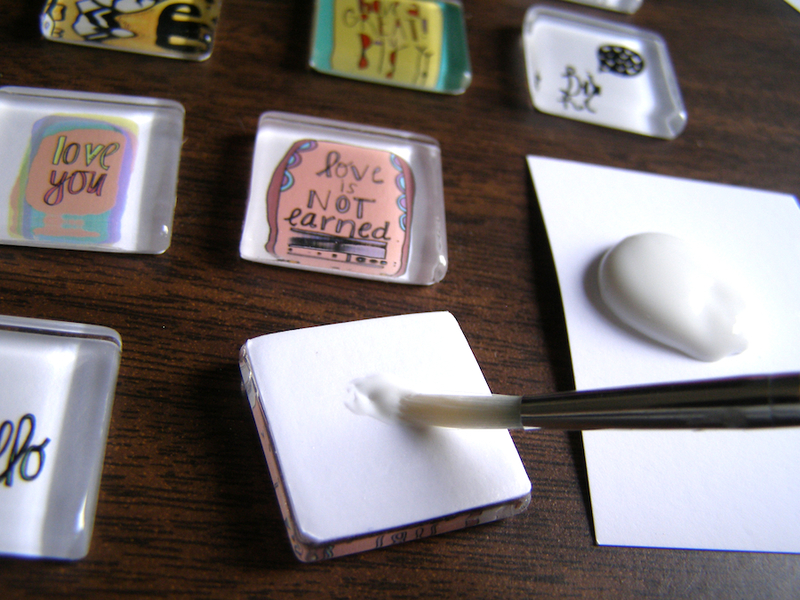 This week I’d like to show you a behind the scenes look at how I create my glass pendants. 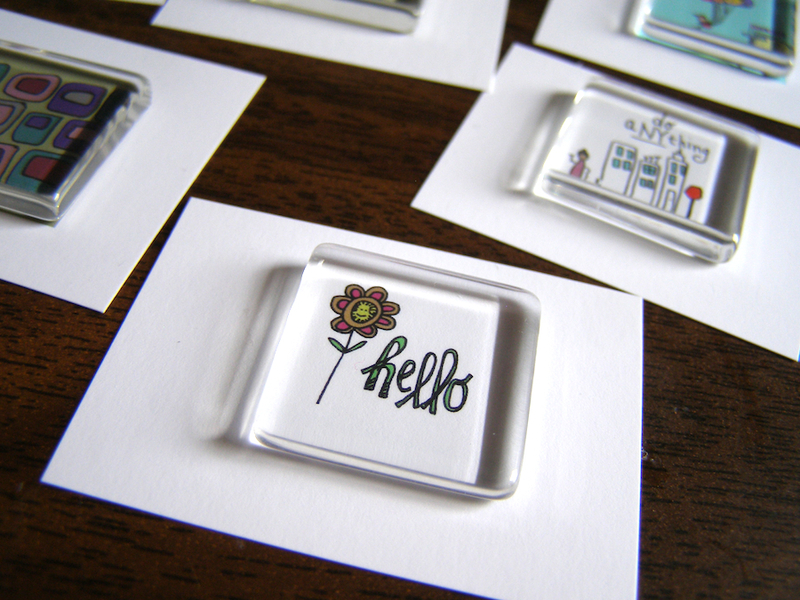 I recently teamed up with Jenipher Lynn of Nightly Doodles. 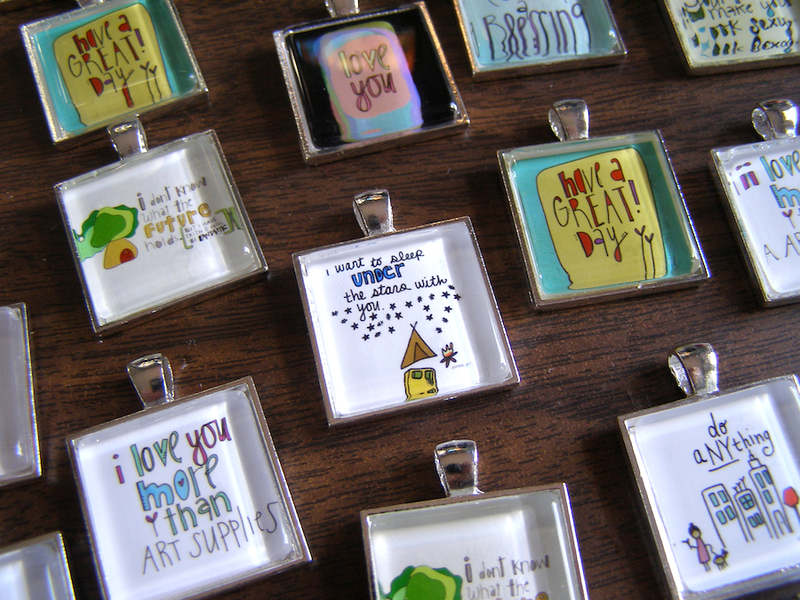 Jenipher creates adorable affirmation drawings that she turns into prints, cards, and onesies. I fell in love with her cheerful and colorful artwork and asked her to collaborate with me to create little pieces of wearable art! Jenipher hand draws her pictures then digitally colors them. She sends the images to me and I print them up and start craftin’! First, I print the images on premium matte paper using an Epson Artisan Printer. I cut each image out and glue a piece of clear glass on top each one. I let them dry for at least 24 hours. 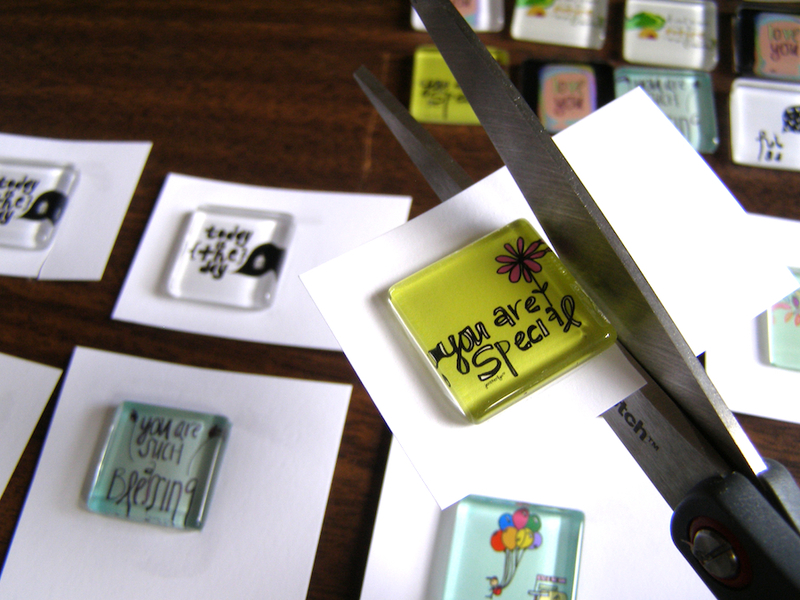 Once they’re dry I cut each piece of glass out individually. 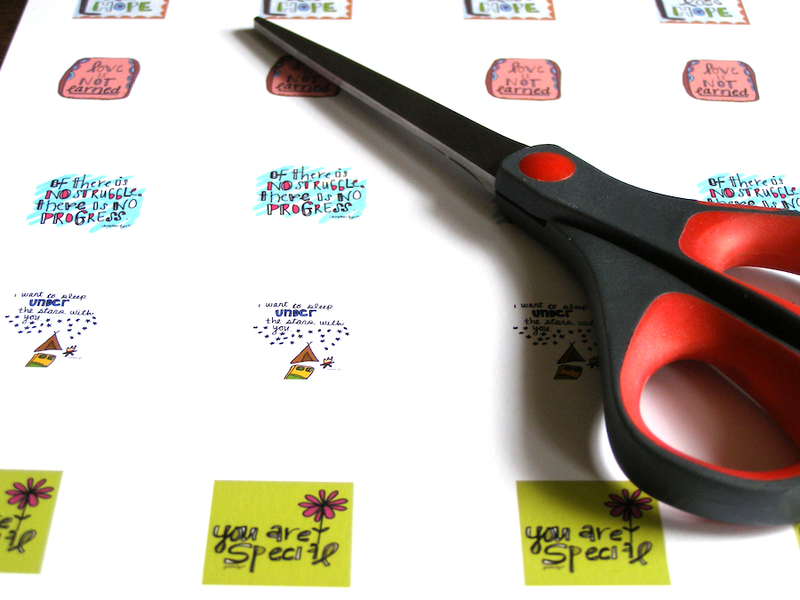 Then I file the edges of the paper to make a smooth edge. I protect the paper with two coats of non-toxic sealer, letting it dry 15 minutes between applications. 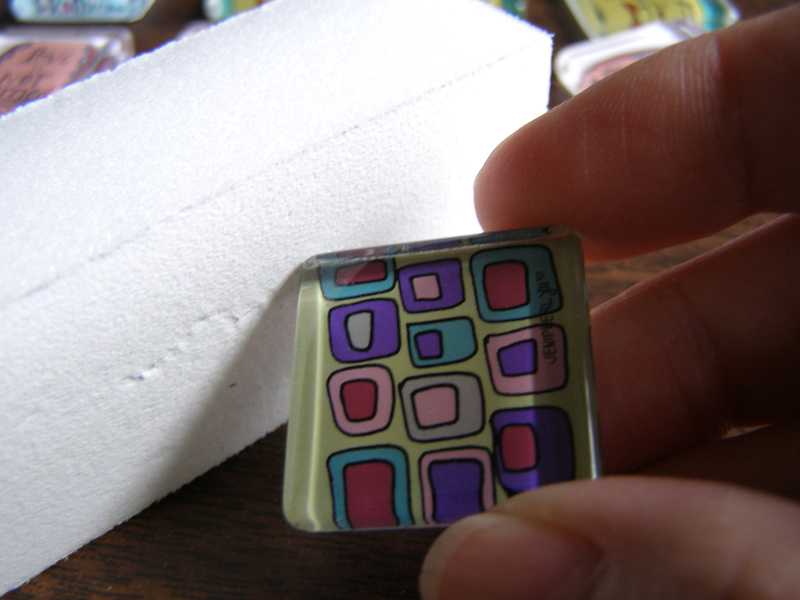 After allowing the second coat to dry for about an hour or so, I adhere the glass pieces inside the pendant trays and let them dry for 2 days. Once dry they’re ready to string on a chain and wear! Jenipher has been selling these at the Chelsea Market in Mahatten. They were flying out the doors until Super Storm Sandy halted things temporarily. Once everything returns back to normal she’ll be at the market until November 17th. But don’t fret! If you can’t make it to New York you can purchase them in Jenipher’s shop. I’ll be posting them in my shop soon too. If you’d like to check out more Nightly Doodles artwork you can check out Jen’s blog. If you see any drawings that you’d like to wear let me know! Jenipher also does custom artwork so if you want to order something special let her know! This entry was posted in Behind the Scenes and tagged affirmations, artist collaboration, artwork, behind the scenes, Chelsea Market, doodles, drawings, Glass, glass pendants, handmade business, handmade necklaces, handmade pendants, motivation, New York City, Nightly Doodles, Pendant, wearable art, wearable art jewelry, wearable art pendants, Zu-Li Designs on October 31, 2012 by Billie Gardner.